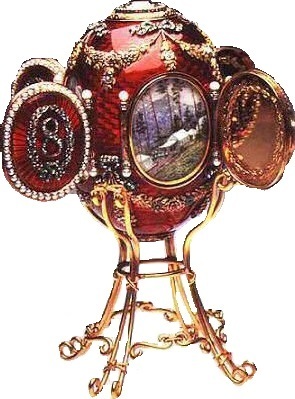 The Imperial Caucasus Egg was created in 1893 and the egg itself features golden swags and garlands held in place by diamond-studded platinum bows on a background of translucent red enamel. Four diamond and pearl-encrusted panels placed around the outside of the egg open to reveal painted miniatures of scenes from the Imperial retreat at Abastouman in the Caucasus mountains. This cross stitch design features the golden garlands and silver bows set against rich red stitches and each corner contains a detailed miniature from the Caucasus portraits. Only whole cross stitch is required, with some backstitching needed for the miniature scenes. This cross stitch kit includes: 14HPI white aida fabric, ready-sorted DMC Stranded Cotton Threads on a numbered card sorter, needle, backing fabric, b&w symbol chart and instructions (cushion filler not included).